I reviewed the Luna by Foreo awhile back and I really liked it. I'm actually still using it regularly. So when I had the chance to try out the Issa by Foreo, I readily accepted. 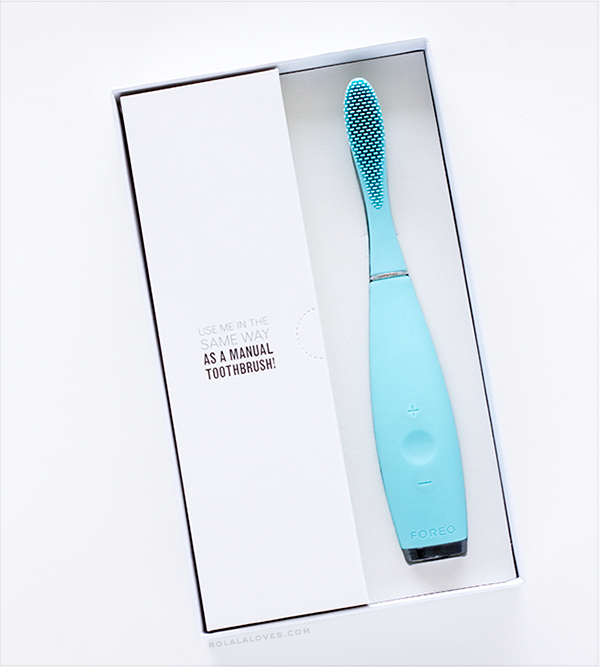 The Issa is unique in that it is the world’s first electric toothbrush made completely out of silicone. Through the revolutionary combination of high-intensity pulsations with silicone bristles, it delivers complete oral care that removes plaque, prevents cavities, breaks up stains and cleans the gums in a uniquely gentle way that does not damage tooth enamel or cause gum recession. 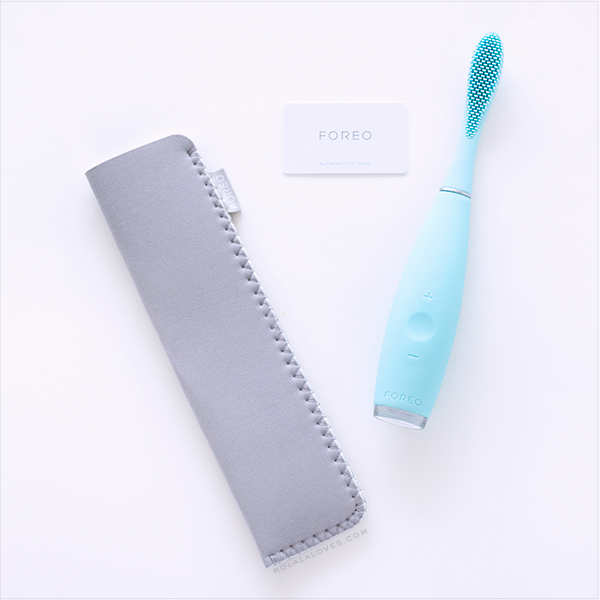 The Facts: The Foreo Issa is uniquely modern and cool looking as far as electric toothbrushes go. It is constructed of non-porous and bacteria resistant silicone and is completely waterproof. It features an ergonomically designed handle and a 3D flexible brush head that adjusts between 8 speed pulsations to your preference. The Issa requires no charging dock and can be used about 365 times per charge. The silicone brush head only needs to be replaced once a year. Usage: Per the instructions, the Issa should be used like a manual toothbrush with your regular toothpaste. You apply toothpaste, turn it on and adjust the intensity using the + and - buttons. You're advised to use wide, circular movements from the edges of the teeth to the gums on the inner, outer, biting and chewing surfaces, going back and forth horizontally. I'm currently a Sonicare electric toothbrush user and employ a quadrant method when brushing my teeth. My brush pulses every 30 seconds for a duration of 2 minutes and the Issa does the same thing. 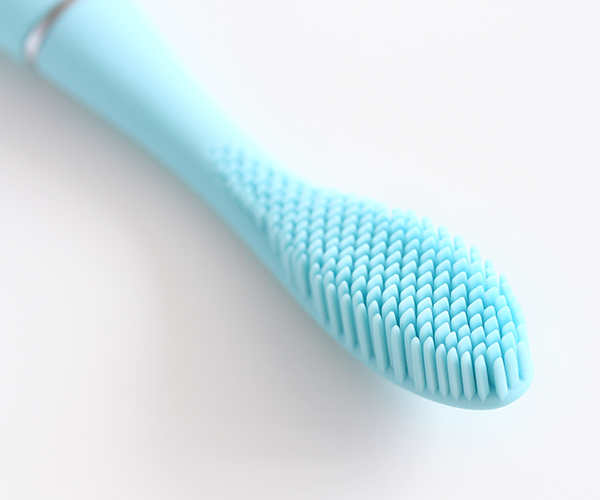 The sensation of the silicone bristles is definitely quite a different experience than the bristles of a traditional type toothbrush and can take a little getting used to since they just softly rub up against your teeth. The trick with the Issa is that you don't have to apply much pressure when using it because of the sonic action. The first few times I used it, I was left with a feeling like my teeth were clean yet unbrushed at the same time if that makes sense. Interestingly the instructions of the Issa directs that flossing be done after brushing which I was thought was a bit odd since my dentist has always told me to floss first. The Good: The shape and weight of the ergonomic handle makes it easy to hold in my hand and the brush itself is quite nice looking especially in this mint color. The silicone bristles feel gentle especially along my gumline and it's much quieter than my Sonicare which is a positive since I'm not a fan of noise. The relative size of the brush is bigger than my usual brush head but I didn't really have a problem with that and the 3D function and length of the bristles made it fairly easy to get into every area of my mouth once I was able to get the hang of it. It's quick and simple to clean and stands upright by itself without the need of a stand. I also like the durability of the battery and only needing to charge the brush just once every 6 months is so convenient. The Not So Good: Maybe it's because I just haven't gotten used to it but I'm never quite sure if my teeth are clean after using this toothbrush and it's due in large part to the overall gentleness of the brushing action in combination with the soft silicone bristles. I guess I just haven't fully gotten used to the idea of not feeling much friction along with the brushing action. You also definitely have to learn the best way to maneuver it around to brush all the areas inside your mouth and one thing it won't do is brush in between your teeth so if you missed something while flossing, this will not be a good backup in that regard. I guess that's why they advise flossing afterwards in their instructions. The Issa retails for $199 which is not exactly cheap but if you break it down by cost per use assuming usage of 2x a day for a year, it works out to 27 cents per use which isn't bad at all. You will have to spend $25 for a replacement brush head once a year but that's better than every 3 months. The Verdict: While I mentioned that I'm not always sure if my teeth feel really clean, I will say that they always feel really smooth after using the Issa and I haven't seen any buildup since I've been testing if for almost 2 weeks. As someone who has dealt with gum sensitivity issues before, I definitely like the way it massages my gums as I'm brushing and for that reason I think I would continue using it but probably just not not every day. I can see this being good for people who have sensitive teeth and gums and those like my husband who is an aggressive brusher who has managed to wear away some of his enamel through brushing too hard. This would probably be difficult to do with the Issa. 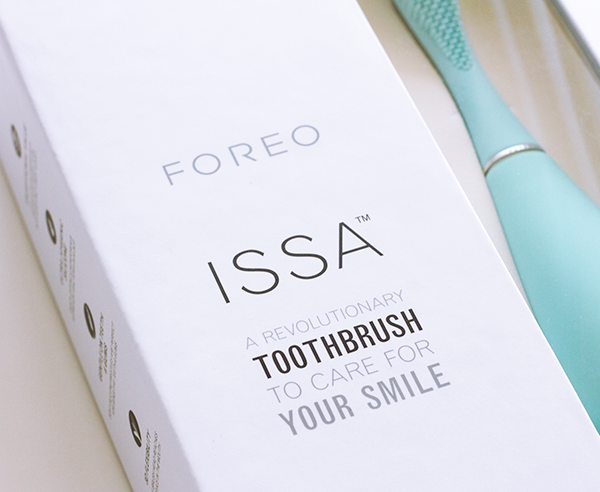 You can find the Issa by Foreo through Foreo's website and major retailers like Sephora, Barneys, and Neiman Marcus. In addition to mint, the Issa also comes in lavender, cobalt and black. 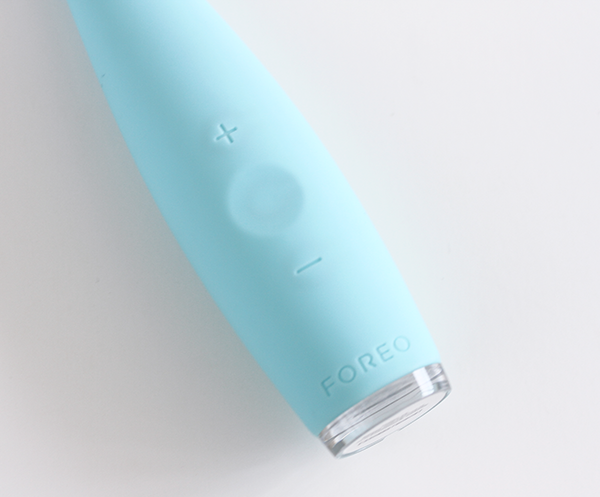 Have you tried the Foreo Issa before? Do you use an electric toothbrush? Disclosure: A complimentary product was provided through iFabbo for the purposes of this review. There was no other compensation and all opinions expressed are my own. I have super sensitive teeth and gums and deal with a lot of inflammation. I think my husband would like this since he can go a little crazy with the toothbrush. Great review. What a stunning product!! I want it !!!!! Love the color and sound like is works perfectly. I would love to try this! Just to see what it's like! love foreo, but would skip this one! it looks cool though. how interesting! 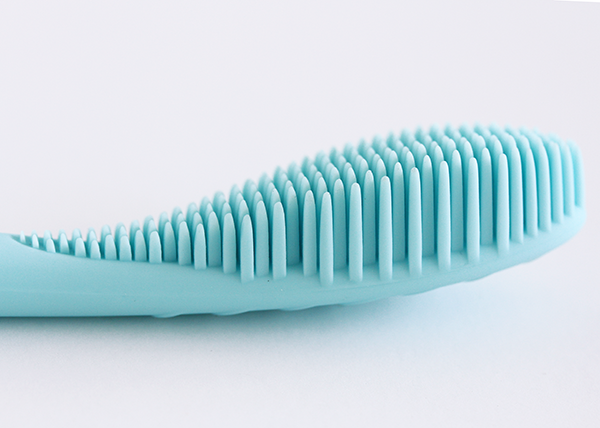 I didn't even know that such a thing as a silicone eletric brush existed. Great review! I'm curious to try it...my gums are sometimes sensitive so I think I would enjoy its gentleness. The fact that the head needs to changed only once in a year is a great advantage. I do change my tooth brushes every 3 months as it advised so this solution seems more practical. I'll have to check it out. I was advised by my dentist to switch to an electric toothbrush because I brush way to hard which has damaged my gums and also my teeth. I haven't bought one yet and so this will be definitely good to look at and consider. The price does seem hefty but I figure if it's for my teeth I am willing to invest if the product is great. Thanks for such a great review. Very helpful! I have been thinking of getting this for myself. It seems really good and like you said, it massages the gum which something that I like. Great review, Rowena. This looks really interesting Rowena! It's so unique! It must be working if you haven't experienced any buildup. The flossing part perplexes me, but everything else it does sounds real good. I would love to try it. I'm totally in love with the design and the colour! I would give it a try if given the chance, especially since my braces are going to come off next month. This is wonderful Rowena .. particularly for those with sensitive teeth or gum issues. Thanks for sharing. Happy Monday! I'd really love to try this, but I'd also worry about not feeling clean after! This looks interesting, I love the color and shape of it But I would want it to work well for my needs I could see not using it on a daily basis but a few times a week Thanks for the information!! Wow, this is such a cool product! The design is amazing! Haven't tried any electric toothbrush yet, and I don't know why I don't give it a try. THanks for sharing your thoughts, Rowena.. I haven't tried an electric tooth brush yet; It was great to know about this particular brand. It's so pretty and the colour is beautiful, Rowena! I'm happy with my Sonicare toothbrush, so I think I'll pass on this one. What an interesting product! I never heard of this one before but I'd love to try it. The silicone definitely makes this electronic brush look cool. It's a little pricey, but super unique. I haven't tried it cos it's quite pricey (sadly) but it sounds great. I have no idea why one is supposed to floss after the brushing?! That's strange. Great review as always Rowena. I wish you a happy Tuesday! I have used an electronic brush but not a silicone one. Love the colour of this one. I've never heard of this toothbrush before, so thank you for introducing this to me. I do like that the battery doesn't fade immediately. I can't stand items where batteries don't last at all. I just love your reviews Rowena. My husband and me are using Sonicare as well! And he is an "aggressive brusher" too, so we have to change the brushes quite often. I've had some issues with my gums that's why I'm afraid new stuff... But this is for real very futuristic and would looks awesome in the bathroom, Rowena! 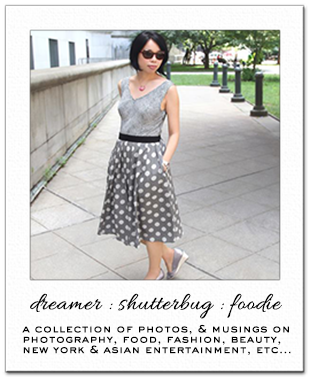 I love visiting your blog and read more about new innovations! I have never used an electric tooth brush as it freaks me out. But this one is so cool looking I am tempted. Great review. And there use to be this guy at the train station I go to in the morning who use to brush his teeth with an electric toothbrush while waiting for the train. It took me a few days to figure out what the noise was...couldn't believe it. Ha! And yes this Yoplait commercials are a pretty obvious rip off. I guess bloggers really are coming up in the world. I remember your review of the Luna and was intrigued by it but I'm a little skeptical about this one. Have you asked your dentist if they've heard of this product and their opinion of it? I think I'd be too scared to use it not knowing if it's doing anything or not, just because I have always had a lot of problems with my teeth. coolest looking tooth brush ever! very interesting. i'm not sure i could get used to this, haha! it would probably be good for me, tho, as i tend to over brush. I knew I had to come here to read this review when I saw it on your IG. So interesting. I've never heard or seen a silicon toothbrush and I understand what you mean about the gentleness and the feeling of not brushing. Wow, this looks really sleek and handy to have a round especially you say it's lightweight and stand upright by itself. Do love the design and the look of it. I have always floss my teeth after brushing, gosh, I guess I have been doing it wrong then *_^ Thanks for the detailed review. nice to know that there are toothbrush like these nowadays.